And it can make a real difference at your Seder. Wisdom from the Four Sons and the Four Daughters. Social Conscience. From Moses to Martin Luther King. Discover contemporary stories of liberation and social action from Egypt to Los Angeles. THE AUTHORS are a father and son team who have shared 26 Seders. Noam, an American Jew, and Mishael, an Israeli, bring these creative cultures into dialogue. This Haggadah combines the experience of Mishael's bestselling Israeli haggadah, Halaila Hazeh (2004), and Noam's classic A Different Night (1997), that made Seders more participatory for hundreds of thousands. Both study and teach at the Shalom Hartman Institute in Jerusalem. Both believe that we can make our Judaism rich, thought-provoking and fun for all. Pesach is the holiday that most concretely represents and celebrates the essence of Jewish identity. The beautiful Exodus story, the elaborate rituals, the emphasis on family, community, and history - all these combine on Seder night to provide a powerful, affirmative Jewish experience. Except, of course, when they don't. All too typically, the Seder – in Israel and America both - is more or less a Jewish Thanksgiving, a warm get-together with little spiritual or intellectual content. The Haggadah is recited quickly and by rote, with the smells of home cooking acting as an added incentive to speed-read the ancient text, or (forgive the pun) pass over it entirely. 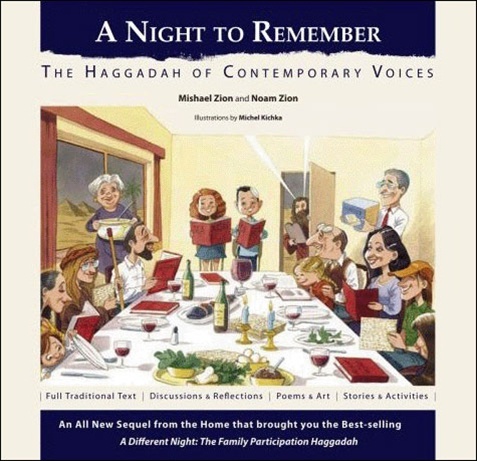 In my view, the publication of Zion family's new "A Night to Remember: The Haggadah of Contemporary Voices " will go a long way to remedy all that. Its contents are so rich, wide-ranging, and pluralistic -- songs and poems, games and quizzes, historical asides and rabbinic interpretations -- that any Jew who is curious about Jewish life cannot fail to be fascinated. Its practical commentary on the Seder service clarifies the evening's rituals. At the same time, passages that elaborate upon the spiritual or mystical significance of such familiar Jewish practices as lighting holiday candles or eating matzah will speak to young globe-trotting Jews who have found other traditions more intriguing than their own. I was especially impressed by the treatment of the Four Sons and Four Daughters, which uses both text and illustration to explore multiple interpretations of this famous parable. Overall, the editors have succeeded admirably in linking the biblical images and philosophical concerns of the Haggadah to modern culture and the exigencies of Jewish life. I've learned something new from every page of A Night to Remember: The Haggadah of Contemporary Voices . In fact, I plan to use it myself when leading this year's Seder. Noam Zion and now his children are becoming a cottage industry for “do-it-yourself” Jewish holidays and rituals. Noam and his son Mishael Zion offer a Haggadah with so many sources, stories, quotes, illustrations, poetry, and commentary. This guarantees a night of lively exchanges and Jewish and contemporary meaning. A Night to Remember: The Haggadah of Contemporary Voices is yet another example of the Jewish Renaissance and ritual creativity. It shows the power of cultural dialogue between Israel and America. The beauty of this Haggadah is that you can use it as the family Haggadah, or as an incredibly rich resource to enhance the traditional or modern Haggadot of your choice. In any event, serious Seder leaders from all the “denominations” will sit down with A Night to Remember days before the Seder to pick and choose what to read and what to do this night, as “different” than last Seder. I warmly recommend supporting this publication. Not only is it a welcome addition to any Jewish table and library, it is an invaluable tool for promoting Jewish meaning and spirit in an age where we need this multi-vocal, richly textured, inspiring Haggadah.